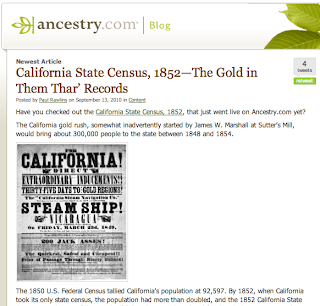 The California State Census taken in 1852 just went live on Ancestry.com. So, of course, I had to see if there were any Greeks listed. There were 14 people listed with Greece as their place of birth. This was during the Gold Rush in California, not suprising, 10 of the 14 people were men listed as Miner's in Calaveras and Placer Counties in California (hotspots of the Gold Rush). There were also 2 females listed in San Francisco, 1 in Sacramento and 1 in Shasta, California. 47 New Links for Western Macedonia - Prefectures Florina, Kastoria, Kozani, Grevena. They will be added to the HellenicGenealogyGeek.com main website in the next week or so when I publish the revised and easier to navigate site. In the meantime, you can view these additional links right here. As always, I invite you to recommend additions to this list that you think would be helpful to those researching their Greek family history. 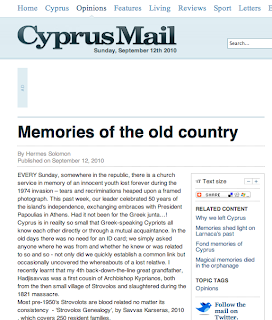 "Memories of the old country" published September 12, 2010 in the Cyprus Mail. "EVERY Sunday, somewhere in the republic, there is a church service in memory of an innocent youth lost forever during the 1974 invasion - tears and recriminations heaped upon a framed photograph." ..... "Cyprus is in reality so small that Greek-speaking Cypriots all know each other directly or through a mutual acquaintance. In the old days there was no need for an ID card, we simply asked anyone where he was from and whether he know or was related to so and so - not only did we quickly establish a common link but occasionally uncovered the whereabouts of a lost relative. I recently learnt that my 4th back-down-the-line-great grandfather, Hadjisavvas was a first cousin of Archbishop Kyprianos, both from the then small village of Stovolos and slaughtered during the 1821 massacre." If you are interested in ordering a copy of this article see my previous posting "Texas - Greek Immigrant Articles" for more details on PERSI and how to order. Good luck with your Greek family history research. 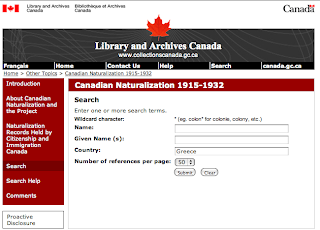 The Library and Archives Canada (LAC) offers an online database titled "Canadian Naturalization 1915-1932". It includes over 200,000 individuals who applied for and received status as naturalized Canadians from 1915 to 1932. This database is one of the few Canadian genealogical resources specifically designed to benefit those researchers with roots outside of the British Commonwealth. References located in the database can be used to request copies of the actual naturalization records, which are held by Citizenship and Immigration Canada. I did a database search with Greece as the country of origin and had 2,699 results. If you have ancestors that migrated to Canada, this may be a great resource for you. Here are 3 articles on Greeks in Georgia from the PERSI Index. See previous posting "Texas - Greek Immigrant Articles" for more details on PERSI and how to order copies of the following articles. Here are 10 articles on Greeks in Utah from the PERSI Index. See previous posting "Texas - Greek Immigrant Articles" for more details on PERSI and how to order copies of the following articles. 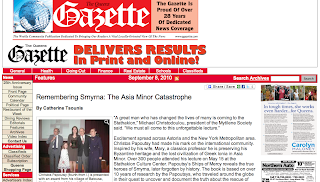 The Queens Gazette, September 8, 2010, published the article "Remembering Smyrna: The Asia Minor Catastrophe"by Catherine Tsounis. The article describes a recent 45 minute lecture given by Christos Papoutsy that was followed by questions and a book signing of "Ships of Mercy". Here are 5 articles on Greeks in California from the PERSI Index. See previous posting "Texas - Greek Immigrant Articles" for more details on PERSI and how to order copies of the following articles. Many of you may already know this, but it is worth repeating. If you live in the United States, chances are that your local library has a subscription to HeritageQuest Online (maybe even allowing you access online from home). From there you can search PERSI (The Periodical Source Index) at the Allen County Public Library, Fort Wayne, IN. You can print a form online and order a copy of any article listed in the PERSI Index. 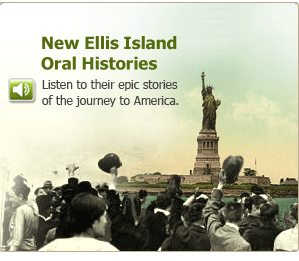 Ancestry is promoting their "Life Stories of Ellis Island Immigrants" Now Available Online for the First Time. I did a search inserting Greece in the "Origin location" field and there were 32 results. These are 30 minutes interviews where the person remembers their life in Greece, the boat trip to the United States, the Ellis Island experience, first impressions and their life in America. I have only had the time to listen to a few so far, but I really enjoyed them. I could pick out things from each story that I am sure were similar to my own yiayia's and papouli's experiences. Oh, how I wish I had tapes of them speaking about their memories. I plan on listening to all of them over the next few weeks. Take the time to listen to them yourself if you can. Ancestry.comis offering FREE access to their Immigration Collection through September 6th. This is a great opportunity - take advantage of it. 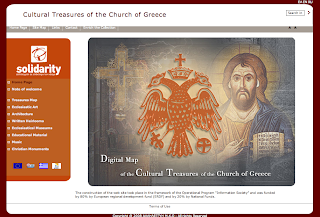 Cultural Treasures of the Church of Greece - Digital collection has 25,000 exhibits and documents. Through the use of the Interactive Cultural Map, the visitor may look at architectural monuments, museums, heirlooms and cultural assets connected with ecclesiastic structures and organizations. Showing an image of Greece divided in districts, the Digital Map offers the possibility for the user to select a particular geographical district and be informed about the ecclesiastical cultural data of that area, in both photography or audio material. Thanks to the MGSA-L Modern Greek Studies Mailing List for originally introducing me to this website. Watch the Greek TV show online "The New Files": The Distomo massacre -- "65 years after a wild massacre, "The New Files: return to the village that was almost wiped out in one day to find out that wounds still remain open."